In his outgoing speech, Tom Wheeler, former chairman of the Federal Communications Commission, made a final plea to protect net neutrality and the consumer safeguards that the FCC put in place during his tenure. You could sense that he knew just how much change was coming under the new administration. Wheeler had become an unexpected hero for open internet advocates that favored his stance on net neutrality, the principle that all internet traffic is treated equally. This came to fruition in 2015 with the Title II changes that listed ISPs as utilities. Those achievements took years, but could unravel much faster with the appointment of Republican Ajit Pai to the role of FCC chief. Pai is an FCC commissioner and former telecoms lawyer—once employed by Verizon. As he is already a commissioner, his appointment will not require any Senate approval. He will, however, need to be reapproved at the end of 2017 in order to further his term. Pai is a staunch opponent of net neutrality and in favor of less regulation in general. Under a GOP-led FCC, we can expect to see the agency change fundamentally, which could have very long term effects for consumers, ISPs, and the internet as a whole. In 2015 Pai voted against the changes to the regulations that would ultimate reclassify ISPs as Title II Common Carriers. The crucial vote enshrined the net neutrality rules we have to day. These rules ensure that traffic is treated equally by ISPs. They prevent the creation of so-called internet fast lanes where one company could pay an ISP to ensure their traffic moves faster than others. It’s believed that such fast lanes would stifle competition and create an unfair environment for smaller players. Pai, easily one of the most vocal opponents to these rules, deemed the regulations as government overreach into controlling the internet for consumers. Photo by Chip Somodevilla / Getty Images. At the height of the net neutrality debate, Politico described the “discernible animosity in the relationship” between Wheeler and Pai, whose positions were polar opposites. Now under the Trump administration, the alleged incumbent said he was preparing to “fire up the weed whacker” and gut net neutrality regulations, which he says stymie innovation and job creation. Undoing these net neutrality rules would presumably bring the regulations back under the Federal Trade Commission. “On the day that the Title II Order was adopted, I said that ‘I don’t know whether this plan will be vacated by a court, reversed by Congress, or overturned by a future Commission. But I do believe that its days are numbered,’” he said. Pai’s past ties to the telecoms industry, namely Verizon, is a regular bugbear for his opponents too. Pai is quick to scoff at such allegations. Having left Verizon in 2003, he’s often quick to point out positions he’s take on matters like digital phone transition. But what has his form been like in other areas? He has stood against local municipal ISPs services; has notably voted against several pro-consumer provisions such as the new privacy laws voted on in October that restricted how much customer data ISPs could share with advertisers; and voted against rules that would allow for cheaper alternatives to TV set-top boxes. He’s attempted to rebuild ties with broadcasters that were frayed by Wheeler. He also opposed lower prices caps for prisoner phone call charges. Photo by Mark Wilson / Getty Images. These are all issues that, along with net neutrality, will inevitably come under the microscope of the FCC again. 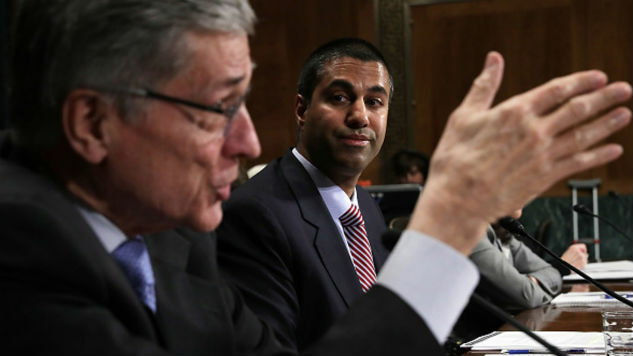 Pai will be joined by fellow Republican commissioner Mike O’Rielly at the FCC who will likely have his back on most if not all of these issues. Mignon Clyburn is the last remaining Democrat commissioner who will have an uphill battle when it comes to debating and voting. At CES earlier this month Clyburn sat on a panel in between her two Republican colleagues and defended net neutrality. “I’ve got two people on my right and my left who might think a bit differently,” she said while admitting that the rules weren’t perfect but were a step in the right direction. O’Rielly in response said the eventual changes were about “economic freedom”. In a separate op-ed Clyburn co-authored, she further espoused the values of the FCC under Wheeler: “Let’s not stack the deck against consumers and innovators”. Prisoner calling is another matter that’s close to Clyburn’s heart. She has advocated for rate caps that ensure prisoners and their families are not charged exorbitant rates by service providers. It’s proven to be a contentious issue. While Pai has suggested some compromises in the debate in the past, he has voted against rate caps. It’s just further evidence of the chasm that exists between Republicans and Democrats and something we’ll see more and more of during this administration.